Length 10.5cms. Width 4cms. Height 3cms. Classic Handmade car, made with love in Italy. The Grand Sport was produced between 1929 and 1934 in six different series, each of which improved over the previous car. These cars were very competitive in rallies and racing during their period. The engine is a 1750cc straight-6 cylinder model with twin overhead camshafts and a supercharger. With it, the car is capable of top speed of 90 mph. 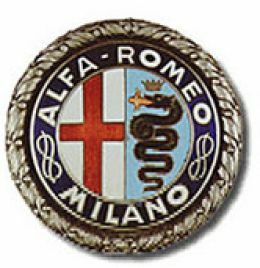 The Alfa Romeo Company began as ‘Anonima Lombardo Fabbrica Automobili' at Milan in 1910. In 1915, industrialist Nicola Romeo took over, and cars built after World War I were given the Alfa Romeo name. In 1920, Enzo Ferrari became a test engineer and driver, later forming his own Scuderia to race Alfa Romeo cars. The early mechanical genius at Alfa Romeo was engineer Vittorio Jano who left Fiat in 1923 and would become responsible for Alfa Romeo's successful line of potent power-plants for years to come. He developed the 150cc single ohc six, followed by DOHC versions in both 1500 and 1750cc displacement. The most potent of the 1750 series was the supercharged Gran Sport. The best way to find out how good this Vintage Alfa Romeo is, is an Alfa Romeo test drive . Without exception, every one who has tried this vintage car, have been amazed at just how good it is. We have a very large in house traffic free area, where you can have test drive all our cllassic automobiles in London and Chester. Please book your test drive n advance as appointments are necessary. 3 - 4 week delivery time depending on specification.